Popular French Newspaper ‘Le Monde’ and ‘Le Figaro’ Reports on SMTOWN Concert in Paris! SMTOWN LIVE WORLD TOUR in PARIS which is the first single brand concert in Europe by Korean entertainment company has been attracting an intense attention from local medias in France. The popular French newspaper ‘Le Monde’ and ‘Le Figaro’ reported on June 10th and June 9th about ‘VISIT KOREA YEAR 2010-2012’ SMTOWN LIVE WORLD TOUR in PARIS concert, sellout of tickets, flash mob protest for an extra concert by French fans and K-pop targeting Europe. ‘Le Monde’ and ‘Le Figaro’ published articles entitled “Korean Wave Strikes Europe” and “The Korean Wave Hits Zénith.” Especially, ‘Le Monde’ reported in detail about S.M.Entertainmet which is leading the Korean Wave and its artists as well as the producer, Soo Man Lee. In the interview with the CEO of S.M.Entertainment, Young Min Kim, he mentioned that the trainees who passed the audition involve intensive trainings in singing, dancing and acting as well as foreign languages for 3~5 years. He also added that all the processes are elaborately structured and S.M.Entertainment seeks appropriate strategy to create a group. Furthermore, he mentioned that S.M.Entertainment which is aiming for globalization also tries to discover talented foreigners like VICTORIA (f(x)) who is a girl majored in classical dance in Ching tao, China. Especially, he stated that K-pop fever began to spread in Europe through social networks and this allowed people there to listen to K-pop music which came from far country despite the nonexistence of advertisement about K-pop in Europe. So, he highlighted the influence of social networks and mentioned that K-pop is the best way to let the world know about Korea so Korea’s export of cultural products will grow larger. Besides these popular news papers ‘Le Monde’ and ‘Le Figaro,’ on June 9th, French radio station RTL also introduced the concert by stating that TVXQ!, Super Junior, Girls’ Generation, SHINee and f(x) will feature performances and tickets for the concert were all sold out. It proved the attention of local media in France and European fans who showed enthusiastic responses by gathering over 1,500 fans at the airport when the artists arrived in France. 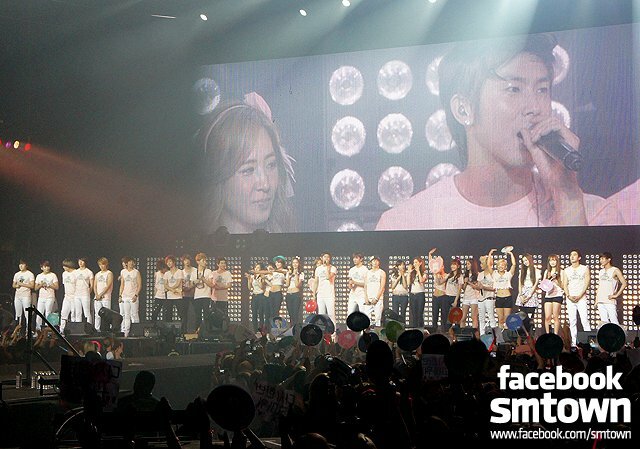 Meanwhile, ‘VISIT KOREA YEAR 2010-2012’ SMTOWN LIVE WORLD TOUR in PARIS will be held for two days at the ‘Le Zenith de Paris’ in France, Paris on June 10th and 11th and the concert will be broadcasted entitled ‘SMTOWN LIVE WORLD TOUR in PARIS’ on MBC on July 2nd. 프랑스 대표 일간지 ‘르 몽드’, ‘르 피가로’ ! SMTOWN 파리 공연 이례적 집중보도! 한국 엔터테인먼트 회사 사상 최초로 유럽에서 펼치는 단일 브랜드 공연, SMTOWN LIVE WORLD TOUR in PARIS에 대한 프랑스 현지 언론의 관심이 뜨겁다. 프랑스의 유력 일간지인 ‘르 몽드’와 ‘르 피가로’는 각각 6월 10일자와 6월 9일자 지면에 나란히 ‘2012 한국 방문의 해 기념’ SMTOWN LIVE WORLD TOUR in PARIS 공연 및 티켓 매진 소식, 추가공연을 요청해 프랑스 팬들이 펼친 시위 내용 등을 전하며, 아시아를 평정한 K-pop의 유럽 공략에 대해 다뤘다. ‘르 몽드’는 “유럽을 덮친 한류“이라는 헤드라인으로 ‘르 피가로’는 “한류가 프랑스의 르 제니스를 강타하다.”라는 타이틀로 기사를 게재했으며, 특히 ‘르 몽드’는 지난 4월 서울 취재 내용을 기반으로 한류를 이끌고 있는 주역인 SM 엔터테인먼트(이하 SM) 소속 가수는 물론 및 프로듀서 이수만에 대해서도 자세히 소개해 눈길을 끌었다. 또한 SM 김영민 대표와의 인터뷰를 인용, 1만여명이 넘는 지원자들이 몰리는 오디션을 통과한 연습생들은 노래, 댄스 연기, 외국어 교육까지 3년~5년간 집중적인 트레이닝을 받는 등, 한 그룹이 탄생하기까지의 과정이 무척 세밀하게 짜여있으며, SM이 적절한 전략을 추구하고 있다고 덧붙였다. 더불어 세계화를 지향하는 SM은 f(x)의 빅토리아와 같은 외국의 재원들도 발굴한다고 언급, 빅토리아를 중국 칭타오 출신의 고전 무용을 전공한 소녀로 자세히 언급하기도 했다. 특히 K-pop 열풍은 소셜 네트워크를 통해 유럽에 퍼지기 시작, 이로 인해 K-pop에 대한 광고가 전무한데도 먼 나라에서 온 이 팝음악을 감상하게 해 주고 있다며, 소셜 네트워크의 영향력을 조명함은 물론 K-pop이 한국을 세계에 가장 잘 알릴 수 있는 방법인 만큼, 한국의 문화 상품수출 비중이 더욱 커질 것이라는 견해도 밝혔다. 이와 같이 ‘르 몽드’, 르 피가로’ 등 프랑스 유력 일간지는 물론 프랑스 라디오 방송 RTL도 6월 9일 방송에서 동방신기, 슈퍼주니어, 소녀시대, 샤이니, 에프엑스등 5개 팀이 공연을 펼치며, 이미 매진을 기록한 콘서트라고 이번 공연을 소개해, 입국 순간부터 1천 5백명이 운집할 정도로 열정적인 반응을 보여준 유럽 팬들에 이어, 현지 언론들의 뜨거운 관심도 다시 한번 확인시켰다. 한편, ‘2012 한국 방문의 해 기념’ SMTOWN LIVE WORLD TOUR in PARIS는 10일, 11일 양일간 프랑스 파리에 위치한 공연장 ‘Le Zenith de Paris’에서 펼쳐지며, 이번 공연은 MBC 창사 특집 특별 기획 ‘SMTOWN LIVE WORLD TOUR in PARIS’라는 타이틀로 7월 2일 방송될 예정이어서 더욱 큰 화제가 될 전망이다.